Join us in saying ‘Hello!’ to the new Google+ Header! Instead of the enormous header size, everything is tighter. As you can see above in ReferLinksFCM’s Google+ header, the information block that appeared at the bottom of each Google+ profile’s header is now positioned to the left. As well as the new positioning, a new dimension size has been introduced. Long gone are the Google+ Profile headers that are 2120 x 1192 pixel dimensions and now each Google+ Profile Header is friendlier 480 X 270 pixels. A drastic downsize! Don’t worry, they’re still is space to put the proper branding, images, and contact information. Less is more! These changes to the Google Plus image size for Profiles and Pages are still new – we just discovered them last night! Stay a head of the trend and adapt to it right away. We have! Are you having trouble with your new Google+ Header? 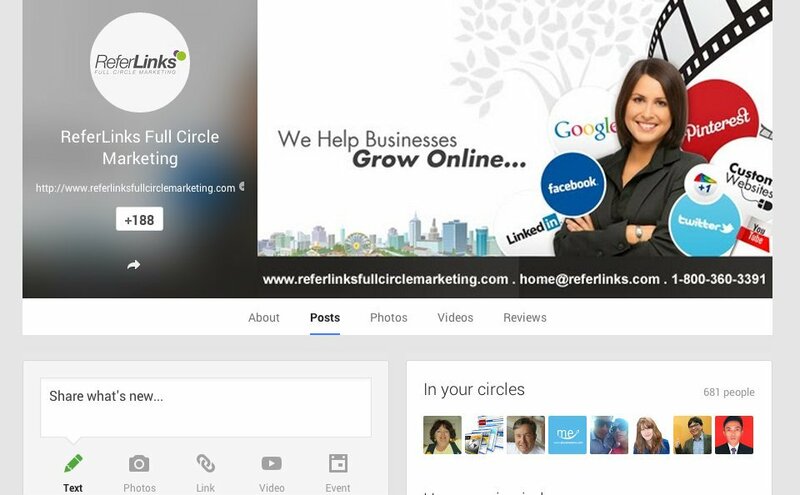 Are you discovering something new about the re-designed headers for Google+? Sound off in the comments and let ReferLinksFCM know how we can assist you!